The survey, commissioned by civil rights groups, also showed marked differences according to race and ethnicity. President Donald Trump's immigration policies and priorities remain deeply unpopular among voters in competitive congressional districts, according to a new poll released by research group Latino Decisions Tuesday, something immigration advocates hope will help boost Democratic candidates in November. According to the poll, commissioned by civil rights groups to survey attitudes toward immigration and Trump's policies, 67 percent of voters said they disagreed with the Trump administration policy of separating migrant families at the southern border — and 73 percent said the policy angered them. A majority of voters (68 percent) also said that Attorney General Jeff Sessions' decision to further restrict U.S. acceptance of immigrants by ruling that fear of domestic abuse or gang violence is not an acceptable basis for granting asylum was a bad idea, while 64 percent overall said the same about Trump's pledge to build a costly wall along the U.S.-Mexico border. But the poll also showed marked differences according to race and ethnicity. Whites were more supportive (41 percent) of spending $25 billion on a border wall than Latinos (29 percent), Asian (27 percent), blacks (23 percent) and Native Americans (35 percent). 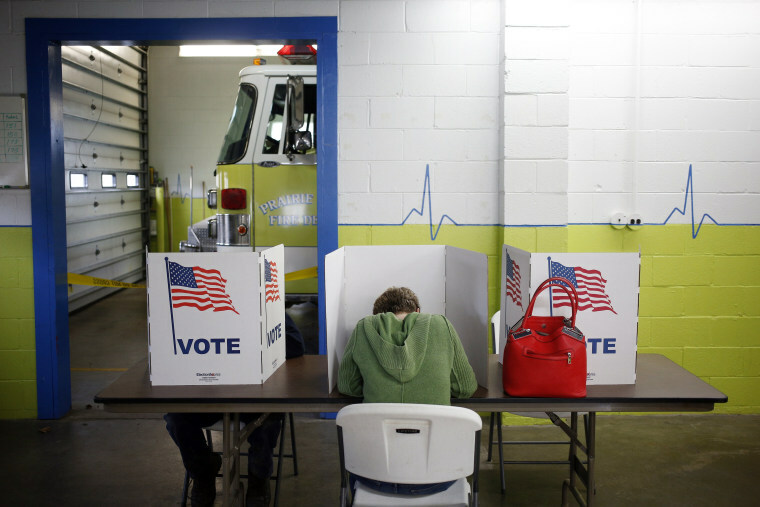 In addition, white voters in the 61 most competitive House districts surveyed were the only group that said they would vote for the Republican candidate over the Democratic one in the midterm election. Forty-eight percent of whites favored the Republican candidate, while 41 percent favored the Democratic candidate and 11 percent were undecided. More than six-in-ten Latinos and Asians, 77 percent of blacks and over half (52 percent) of Native Americans said they would vote for the Democratic candidate. Overall, a majority — 51 percent — said they favored Democrats. The poll of Latino, Asian-American, Native American, African-American, and white Voters interviewed over two thousand voters in competitive congressional districts, including 400 registered voters from each racial and ethnic group, which allows analysts to look at voter attitudes among these groups comparatively. The Native Americans participating in the survey were drawn from a 50-state national sample, rather than from the competitive districts because of their unique geographic distribution. The survey was headed by the polling firm Latino Decisions on behalf of America’s Voice, an immigration rights and advocacy organization, as well as Mi Familia Vota, Indivisible, NAACP, The Immigration Hub, and AAPI Civic Engagement Fund. All groups overwhelmingly preferred a compromise on immigration reform, working with Democrats to fix President Obama’s Deferred Action for Childhood Arrivals (DACA) program and protecting the group of young immigrants known as Dreamers. In total, 68 percent of voters wanted Republicans to compromise and work with Democrats on immigration reform, with black respondents showing the greatest desire for the two parties to work it out. White voters, however, showed the least support for compromise, at 41 percent, however, still a large majority preferred that the parties work together to solve the immigration problem. A majority of Latino, Asian, Black and Native American voters said the following statement was "true" instead of "false": "Trump and the Republicans are increasing hate and racism against Latinos, blacks and Muslims. The only group not in agreement were white respondents; under half (47 percent) thought this was the case. Coming on the heels of a national conversation surrounding the Trump administration's recent policy separating of children from migrant parents after they crossed the U.S. border, the results of the survey suggest candidates running in these Congressional districts should focus on issues that unify voters — and that Republicans could suffer the consequences of Trump's divisive policies and proposals. NewsCan David Garcia catch the blue wave to become Arizona's next governor? But Democrats have work to do if they want voters to know that the recent family separations policy was issued by the Trump administration, however. The poll found almost six-in-ten (57 percent) white voters think Democrats are responsible for the policy; over half of Latinos and Asians, more than six-in-ten Native Americans and more than four-in-ten blacks think the same.